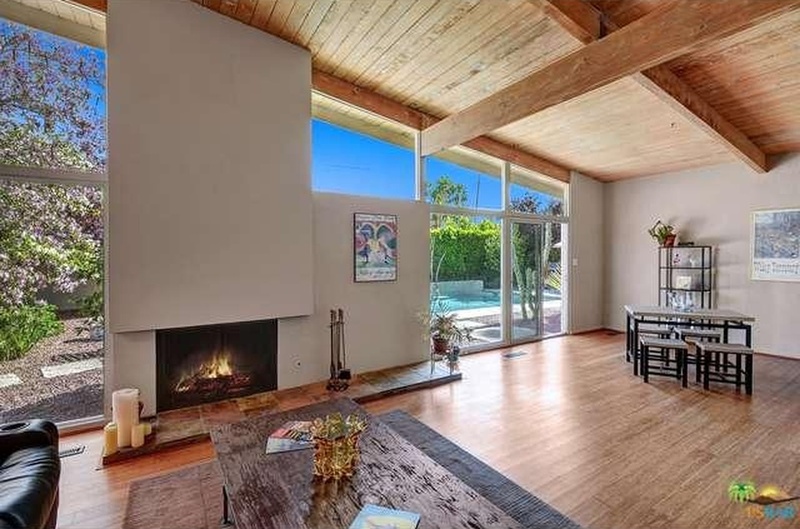 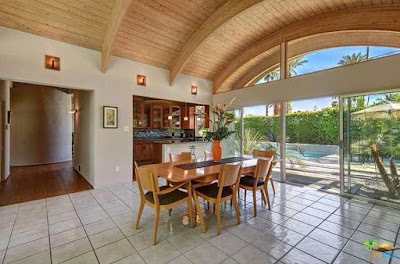 New to the market is this 1960 Palmer & Krisel-designed home built by the Drogin Construction Company in San Diego’s College Glen Estates. 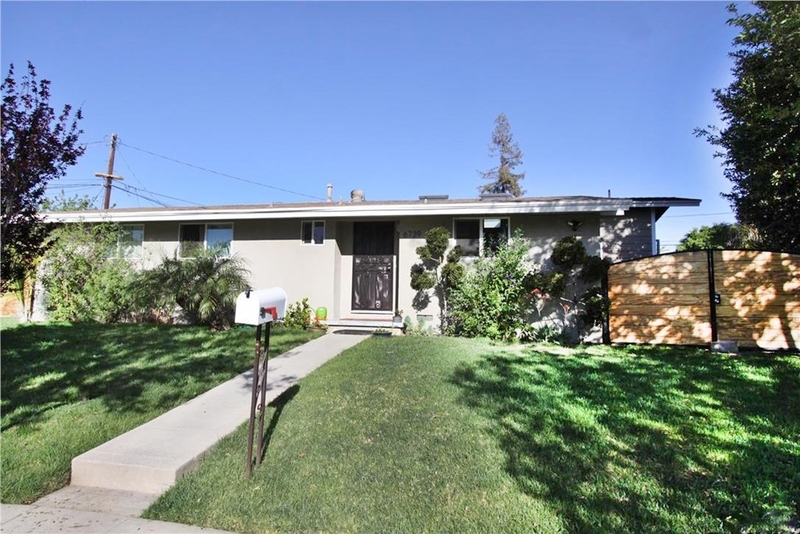 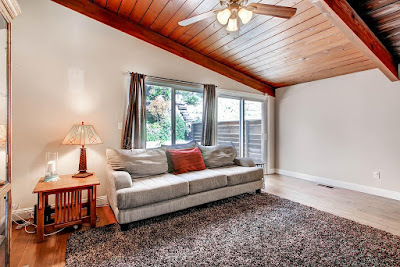 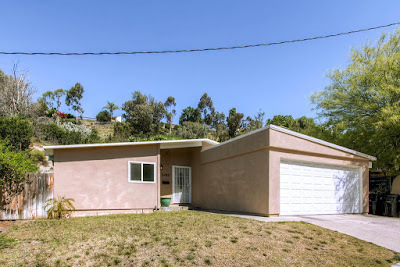 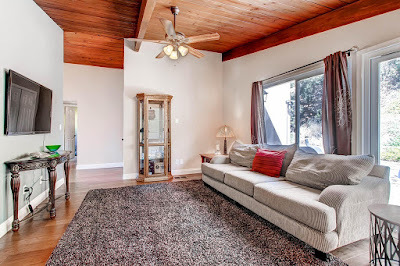 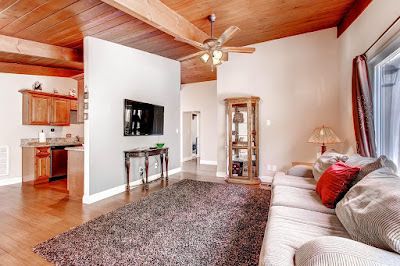 With three bedrooms and two bathrooms in 1,153 square feet and a two car garage on a 6,400 square foot lot, the asking price on this home is an attractive $475,000. Once the victim of a flip in 2012, the home has seen its original clerestories stuccoed over, received a Victorian oval-windowed front door, and had its signature Krisel floor to ceiling front window cut in half. 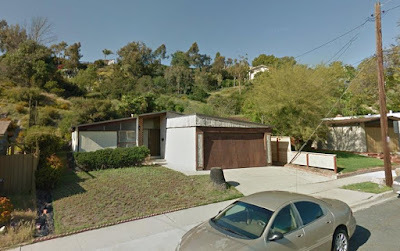 At one point before the 2012 flip the flat-roofed garage had a pitch, different from that found on the main structure of the home, added to it. The pitch survived the flip, and like the clerestory windows, was stuccoed over. 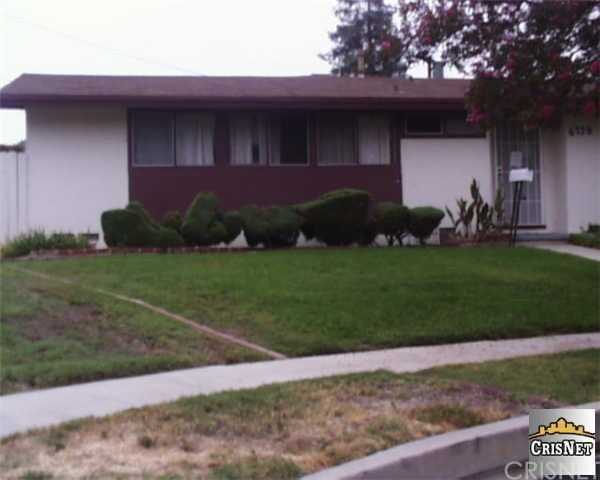 The south-facing front yard is treeless, consisting mainly of a patch plot of turf, ready for a modernist water-conserving makeover. Inside, the living and dining rooms sit at the rear of the home, while the three bedroom line the west side of the residence. 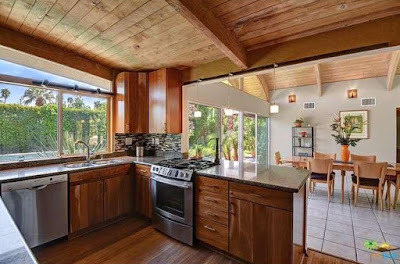 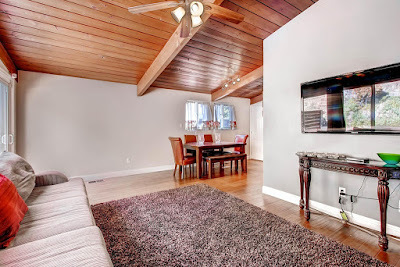 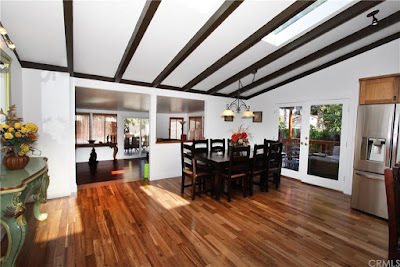 The original open beamed vaulted ceilings are still in place throughout the home, and the floors have been covered in wood laminate. The living room overlooks the backyard through a large sliding glass door and nearly full-height windows, and is open to the adjacent dining room which sits at the northeast corner of the home. 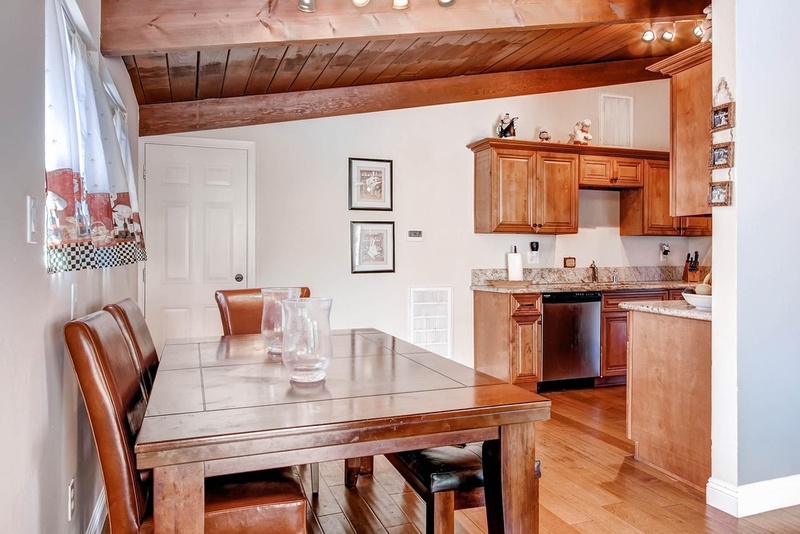 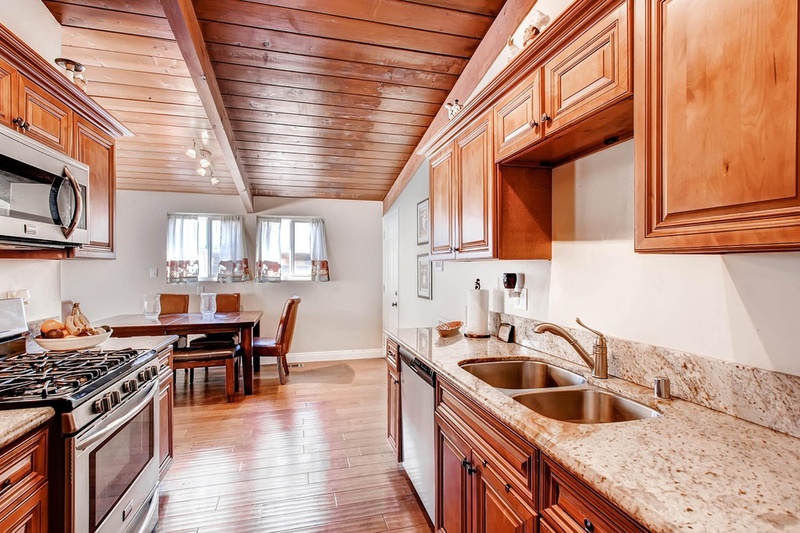 The galley kitchen lies between the dining room and entry hall, and is open to the dining area. 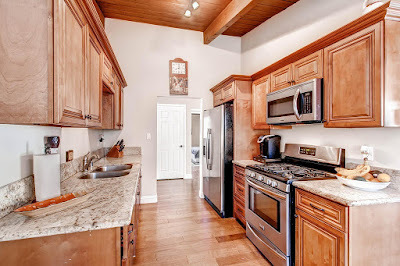 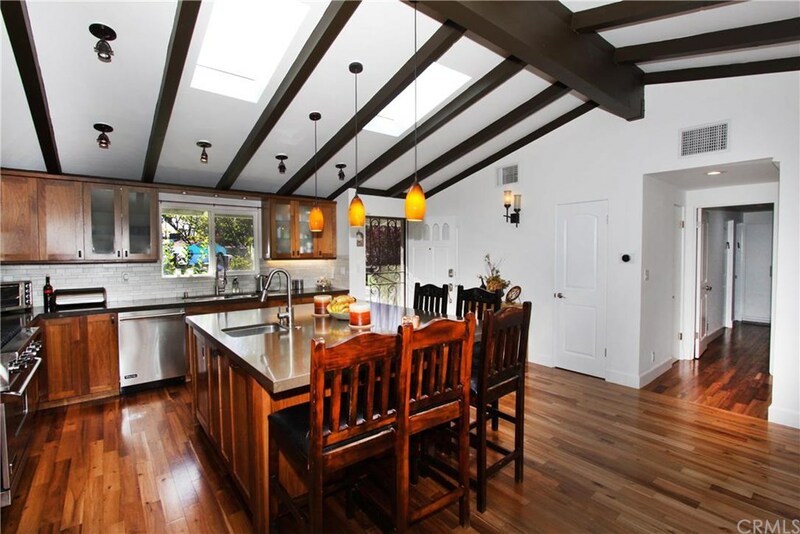 The kitchen appears to have received it’s makeover during the 2012 flip, with raised panel cabinetry, granite counters, stainless steel appliances and elaborate crown molding. 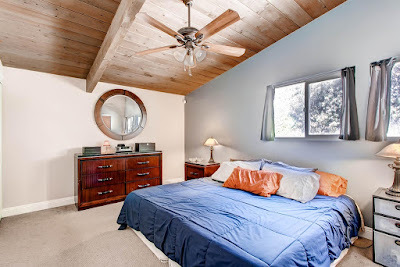 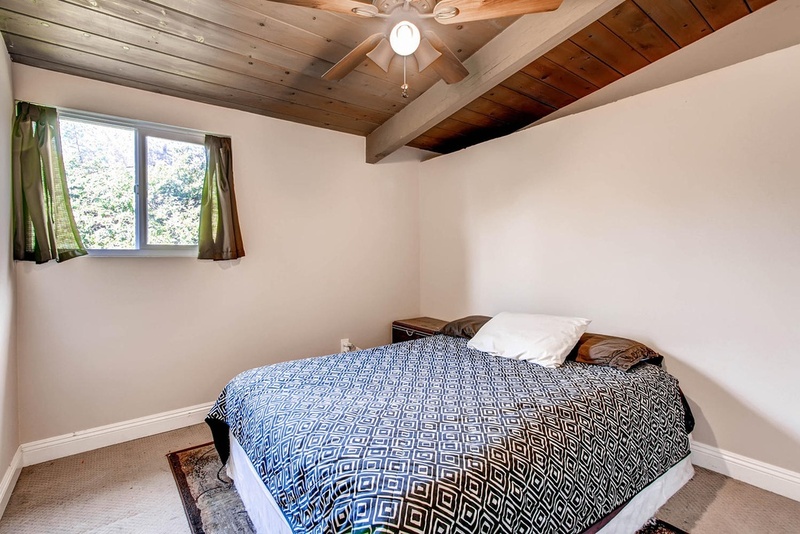 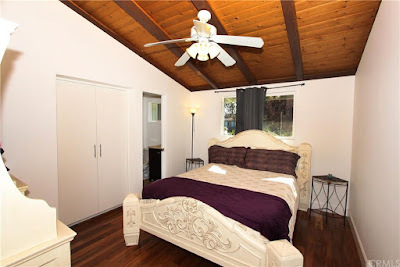 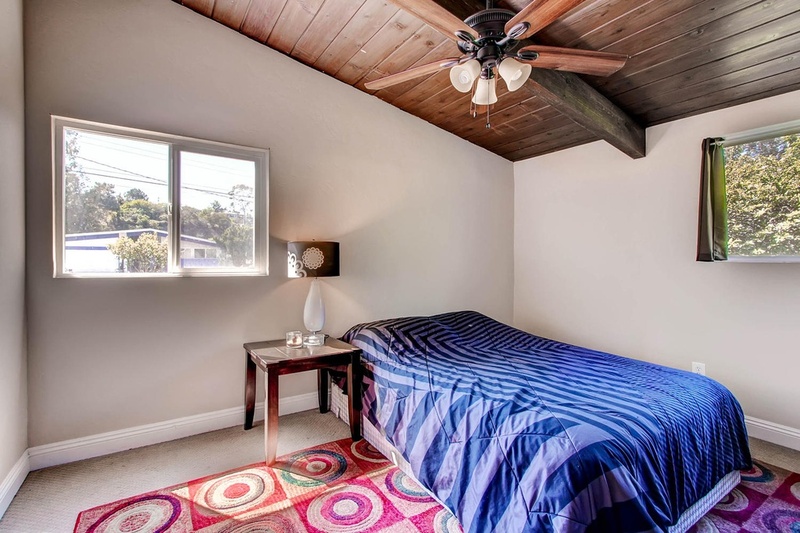 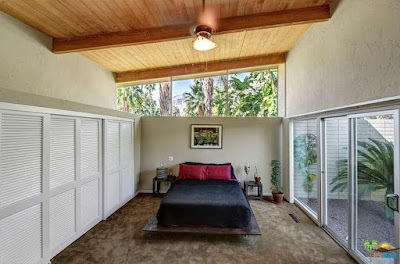 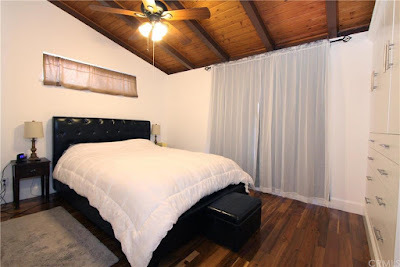 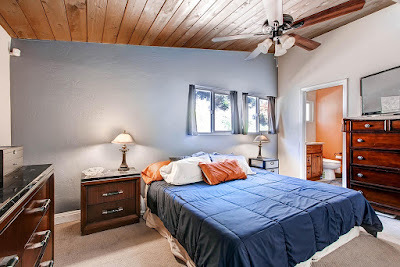 The master bedroom sits at the rear of the home, with a pair of small windows overlooking the backyard. The master bath received its updates in 2012, with a granite topped raised panel vanity and travertine and glass mosaic shower surround. The secondary bedrooms lie at the side and front of the home, and the guest bath has received a makeover identical to that of the master bath. 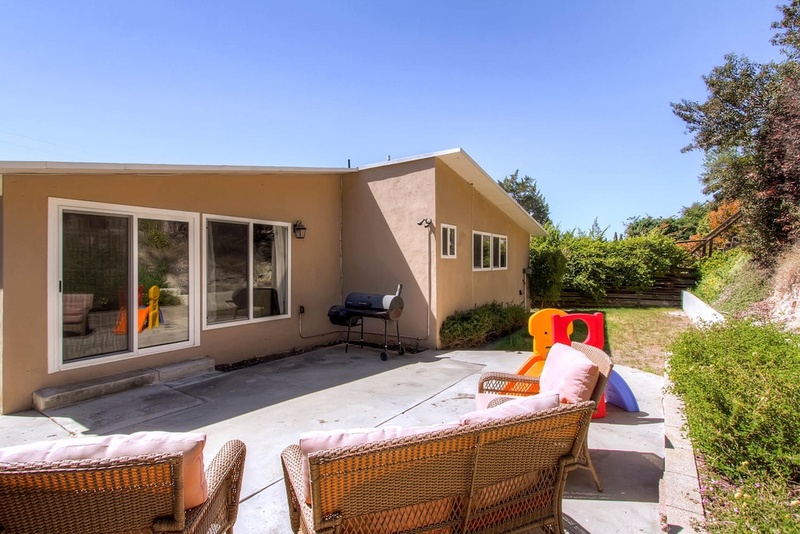 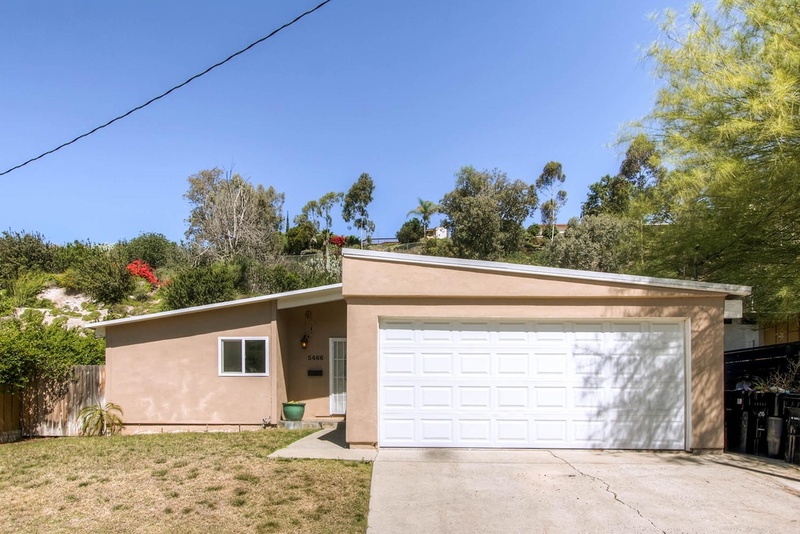 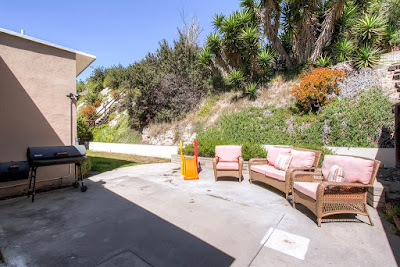 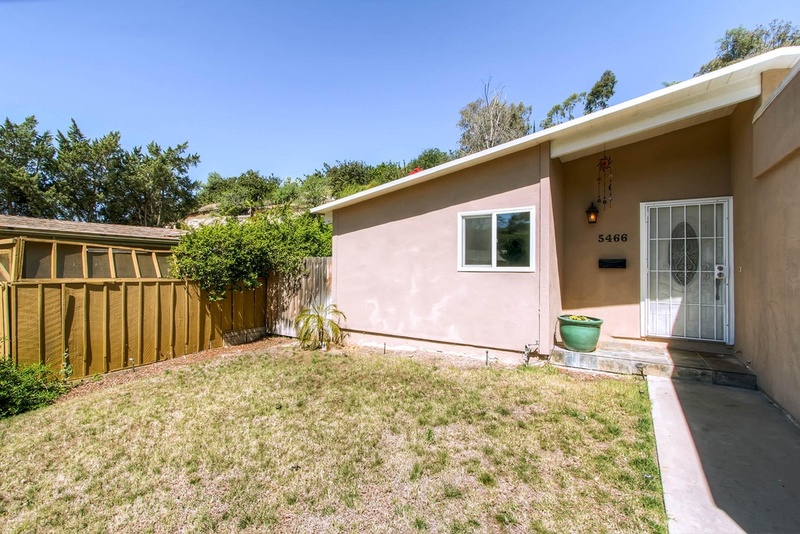 The backyard backs up to a hillside, but retains a flat concrete patio off of the living room and a flat turf area surrounding the rear of the property. 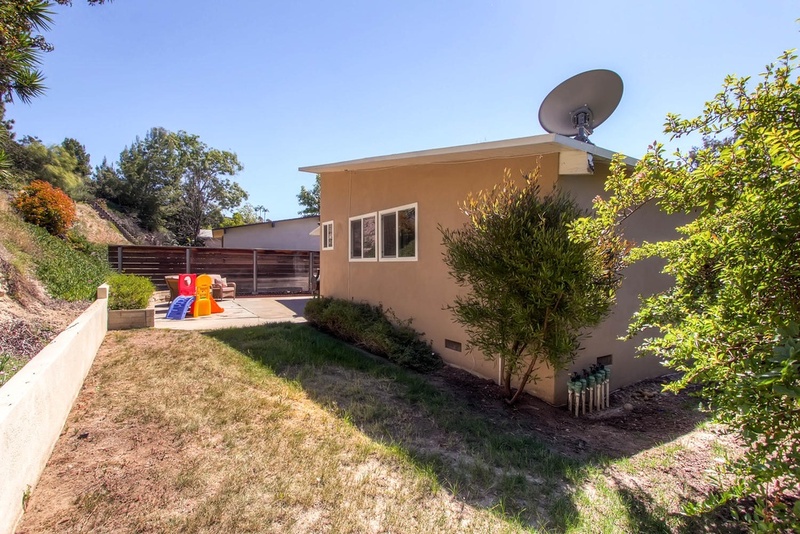 Mature native plantings line the hillside, giving it character and greenery. 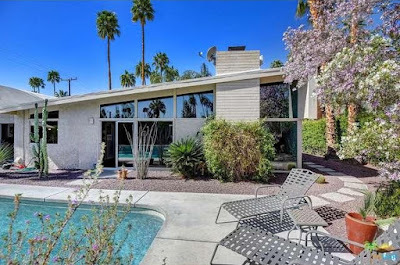 The price is appealing for this community, and hopefully the new owner will move to put some of the modern back into this midcentury modern home. 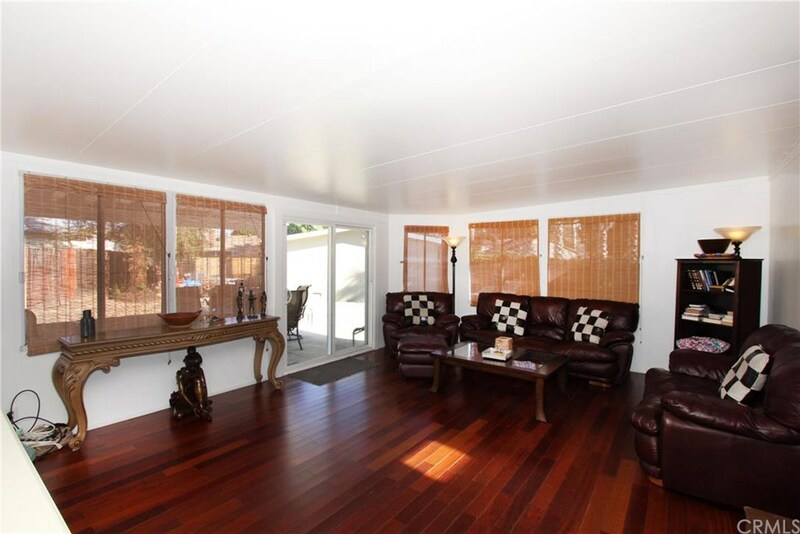 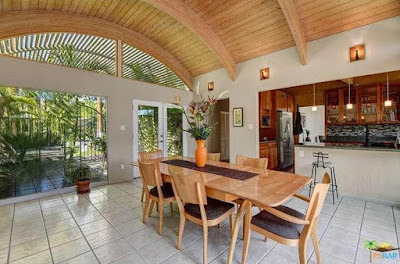 Built in 1957 by the Alexander Construction Company is this modified Palmer & Krisel-designed butterfly-roofed home in El Camino Estates. Situated adjacent to the iconic Twin Palms Estates, this expanded home includes three bedrooms and three bathrooms in 2,171 square feet, a two-car garage and an in-ground pool all on a 10,400 square-foot lot with an asking price of $769,000. 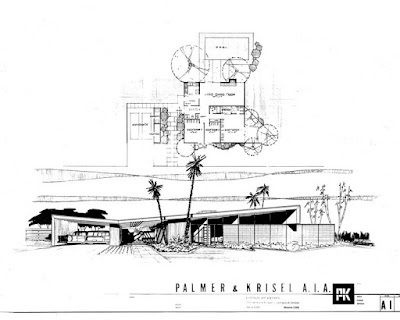 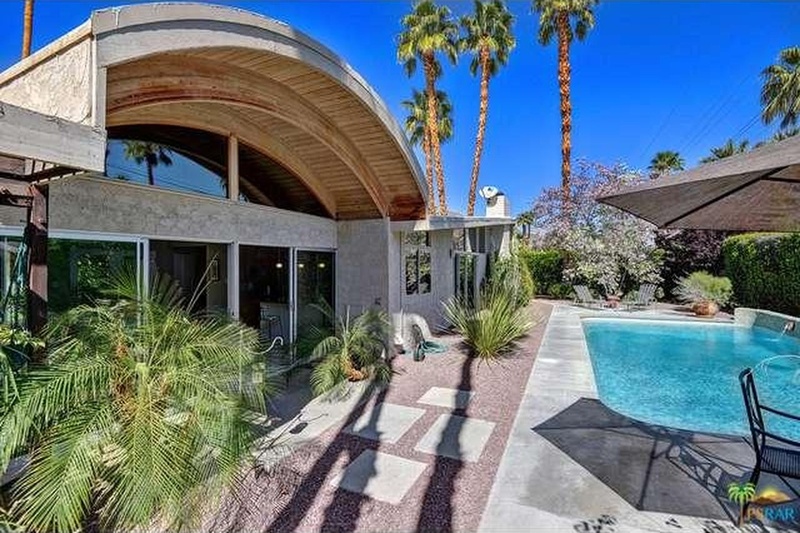 Set amid a sea of palm trees in lush green yard, the most glaring modification that this home has received is the presence of a large barrel vaulted addition located at where the center of the roof valley would have been located. 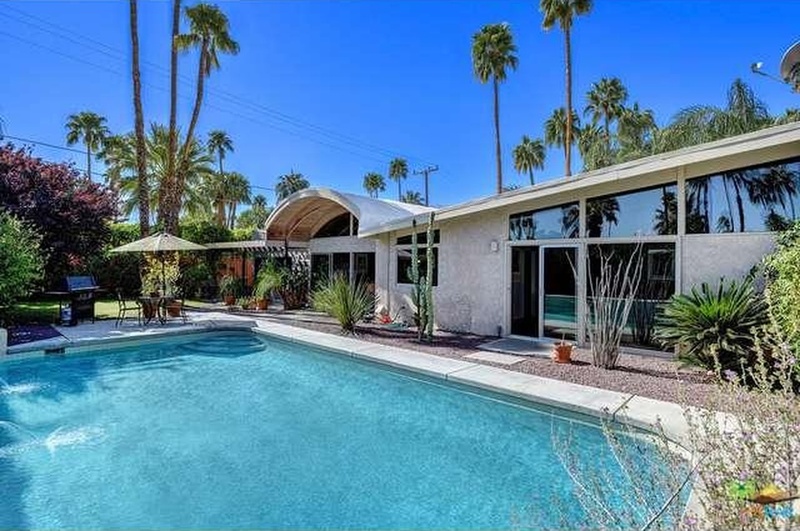 The original two-car carport has been converted to a garage, the exterior of the home has received a lace stucco finish, while the entry sits recessed under the barrel-vaulted trellis where the original courtyard once stood. 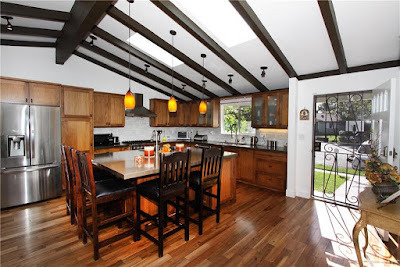 Entering the home through a pair of single panel glass French doors, the barrel vaulted addition was crafted quite well and with an eye for detail, with an open beamed ceiling that mimics that found throughout the original portions of the home. Glass windows at the front and rear of the room, along with heavily planted adjacent areas, give the home a tropical, resort-like feel upon entering. The original entry hall sits off to the side of the barrel vaulted entry, and leads into the original portions of the home, with rear-facing living room and front-oriented bedrooms. The living room retains much of its original charm, with Krisel’s signature modernist fireplace flanked by floor-to-ceiling walls of glass. 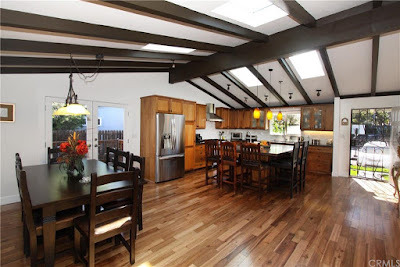 The kitchen has been reconfigured in a U-shape, slightly more closed off to the original dining room than what would have been originally found while the former exterior wall has been opened to the barrel vaulted entry hall. 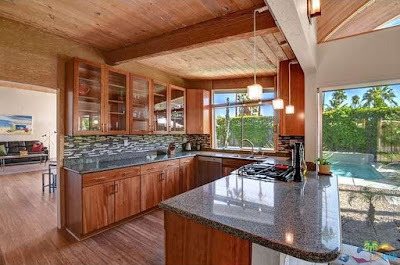 Clean-lined wooden cabinetry topped with granite countertops fills the room, while glass mosaic tile backsplashes, pendant lights and stainless steel appliances finish the room. The three bedrooms are in their original configurations, with the secondary bedrooms overlooking the flush front yard with mountain views through floor-to-ceiling windows and clerestories. 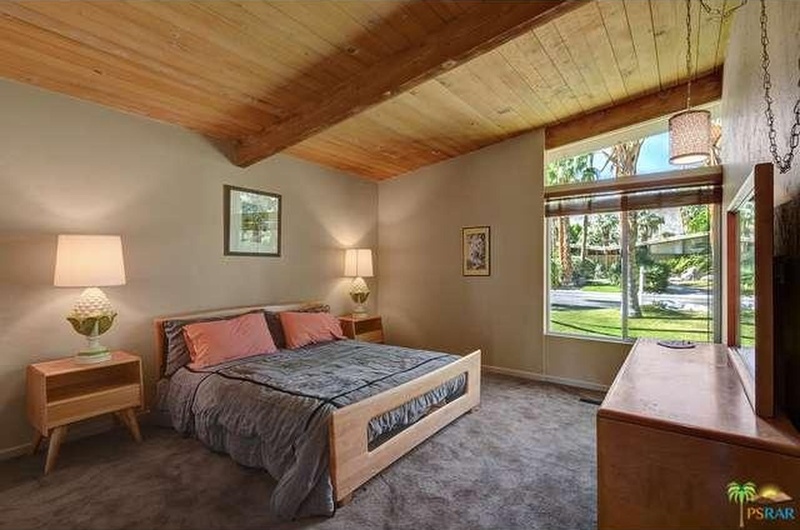 The master bedroom offers front-facing clerestories with large sliding glass doors accessing a private side yard patio. 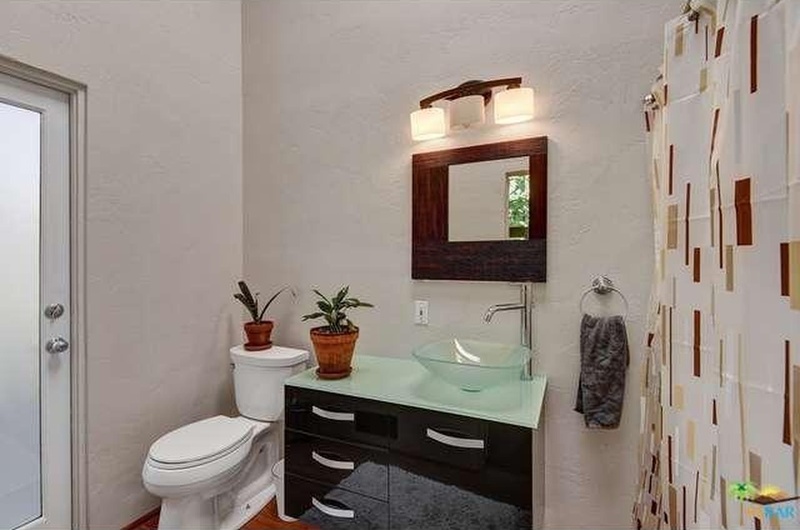 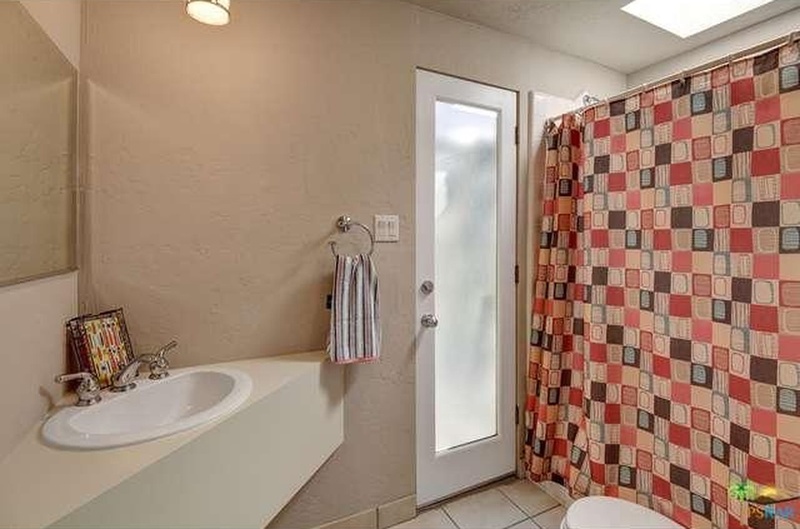 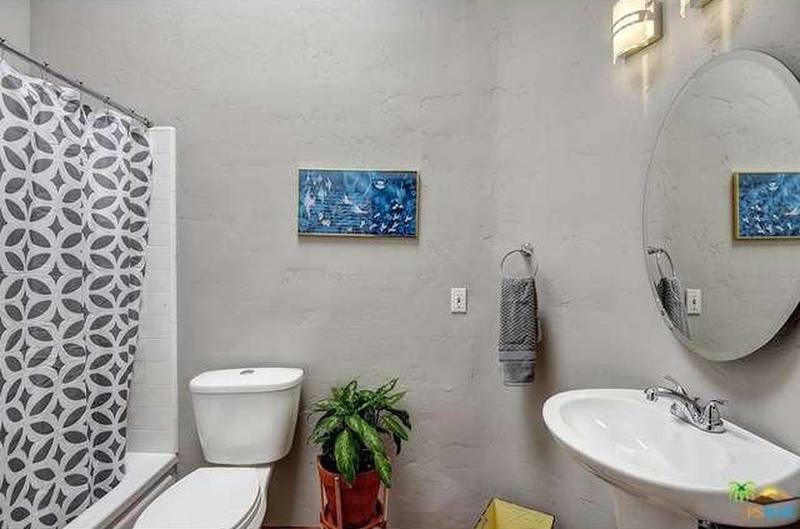 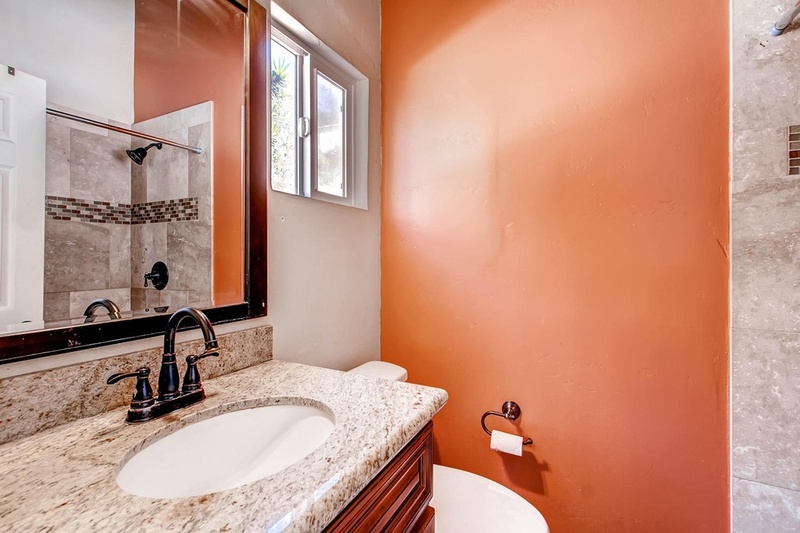 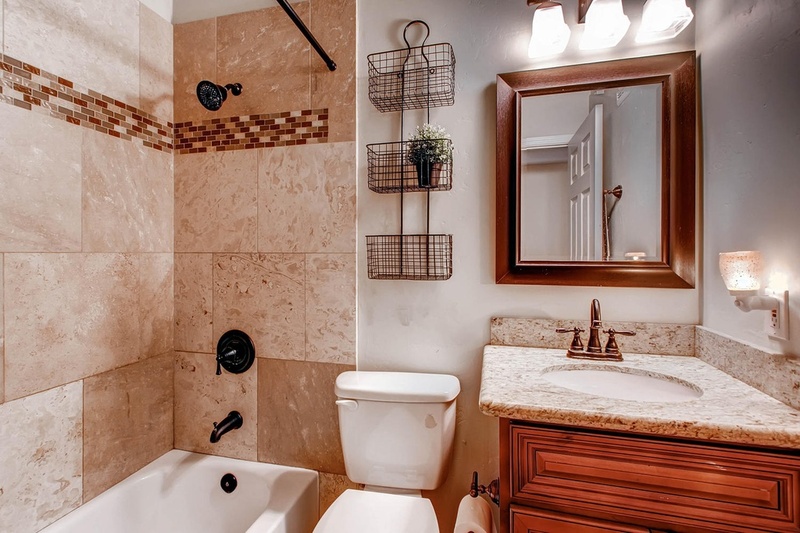 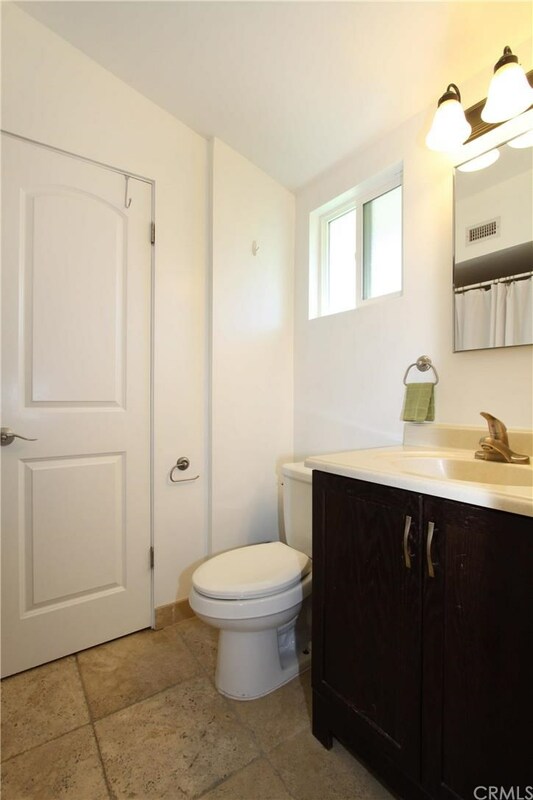 Both the secondary bathroom and master bathroom have been updated, with newer fixtures and finishes that are clean-lined in form. 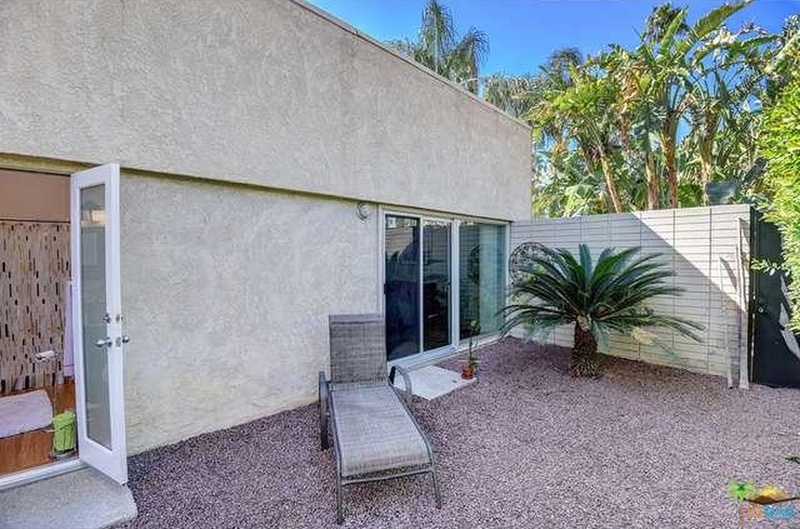 A small cabana addition sits at the rear of the garage, and provides a third bathroom and multi-purpose room with wet bar. The backyard maintains its original rectangular 15’ x 30’ swimming pool, with desert plantings surrounding the rear of the home. Small sundecks sit at either end of the pool, while tall privacy hedges and mature plantings line the perimeters of the yard. This home presents an interesting opportunity to restore the original form which makes this Krisel elevation so special, or enjoy the uniqueness of the barrel vaulted room and enjoy it from the inside out. 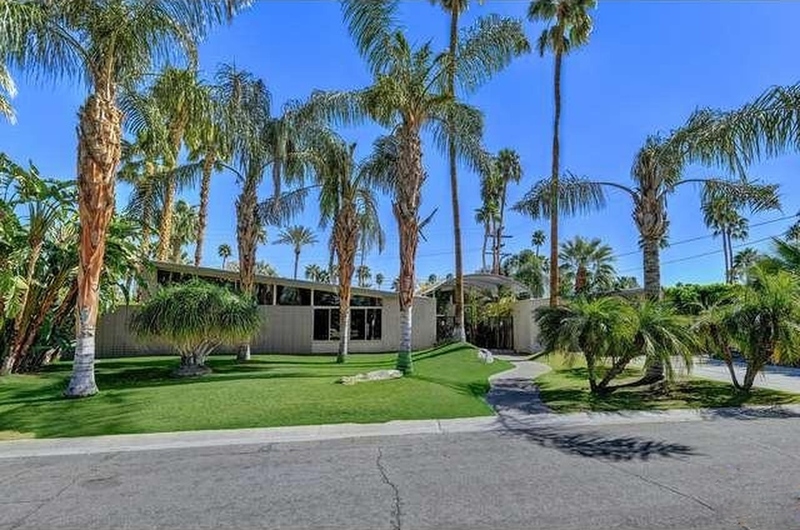 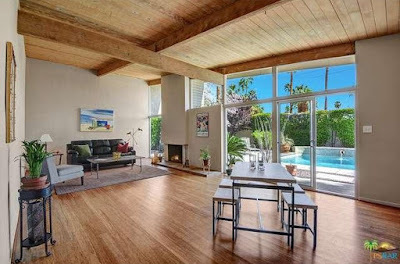 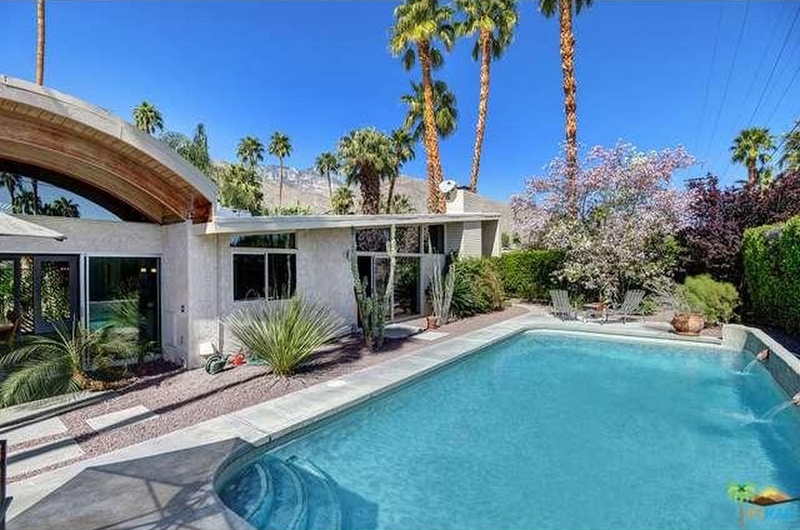 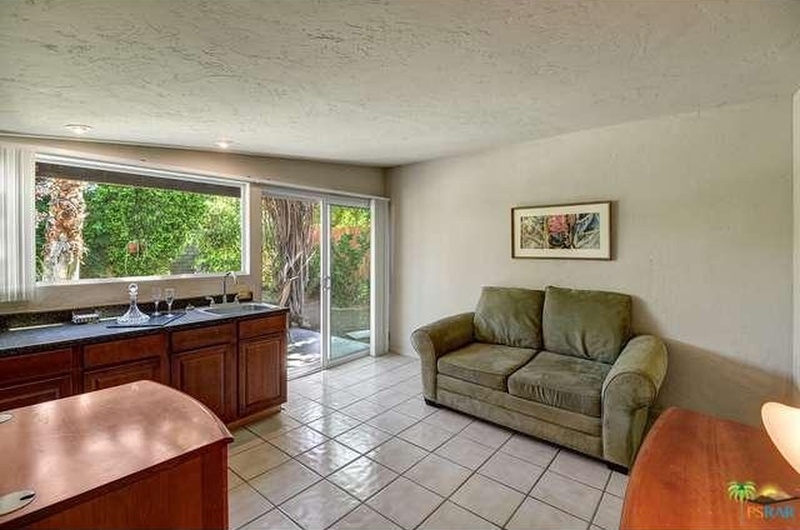 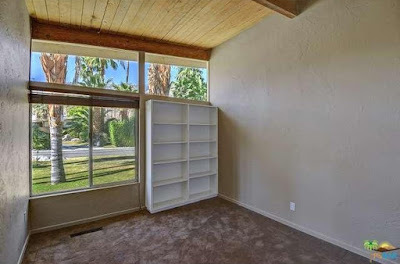 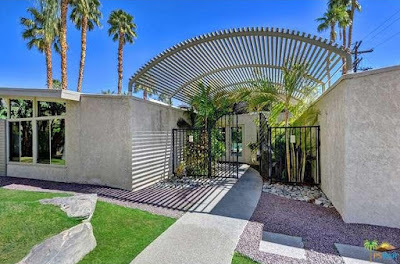 Either way, it’s a great home that offers a slice of paradise in a quiet Palm Springs neighborhood.